got their AADHAR card through mail/courier. 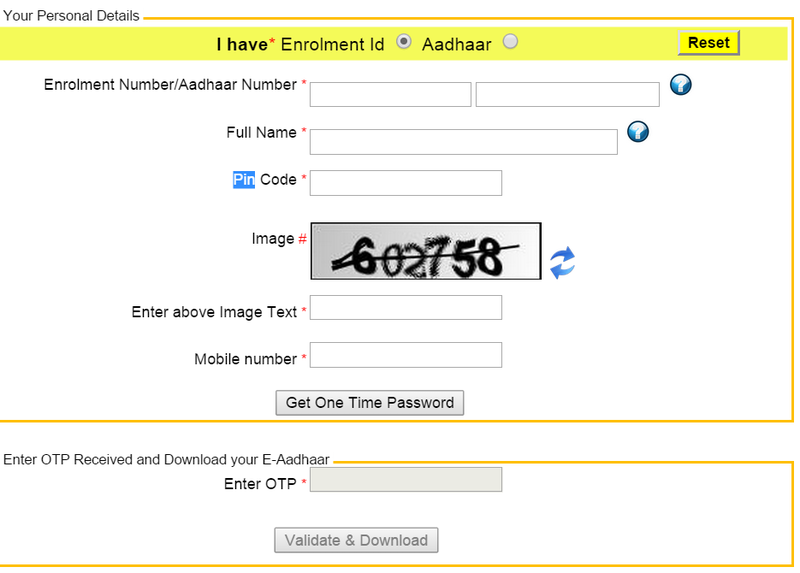 For www.uidai.gov.in download AADHAAR Card (आधार कार्ड डाउनलोड)you should know your enrollment number and Date and Time of enrollment. All these things are printed on the receipt your receive from the enrollment officer. Enter the details required. First Choose Enrolment Id if you don't have aadhar card else choose Aadhaar if you have aadhar card number. After that fill in the form as asked in the blanks. Enter only your registered mobile number in mobile number box, the one you used to give to enrollment officer during the time of the aadhaar card form filling. Then click on Get One time Password. After that you will receive a password in your mobile through sms (can take few minutes sometimes) which you have to input in the Enter OTP box. Then click on Validate & Download. Your AADHAR Card will start downloading soon. Print and laminate it.You are done. Aadhar card download online by name is not possible as uidai has not provided any option for that. Also, if this facility would be available then any one can download the card if he or she know your name and then they can misuse your identity. For Any AADHAR Card related help do comment below, we will try to reply as soon as possible. Note: This site is not an official site and we are not associated with UIDAI in any form.